Look, we've got oysters Rockefeller! Beef Wellington! Napoleons! We leave this lunch alone, it’ll take over Europe. 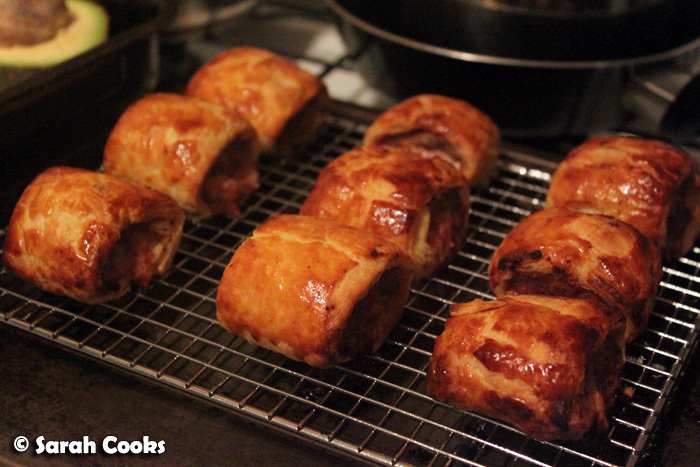 One of the most popular items at my birthday party this year were my mini-beef wellingtons. When you're hosting a cocktail party, it's really important to have some reasonably substantial food on offer (not just to be responsible, but also to keep the menu balanced). I adapted this recipe (see below!) from the April 2011 issue of Delicious magazine, miniaturising their mini-wellingtons into canapé size, making the pastry from scratch, and adding the most important ingredient: a soaked bread roll. As I have no doubt told you before, whenever I'm making anything based on mince - burgers, Frikadellen, stuffed capsicums, meatloaf - I always add a stale bread roll, which has been soaked in water for 5 minutes, and then had the excess liquid squeezed out. 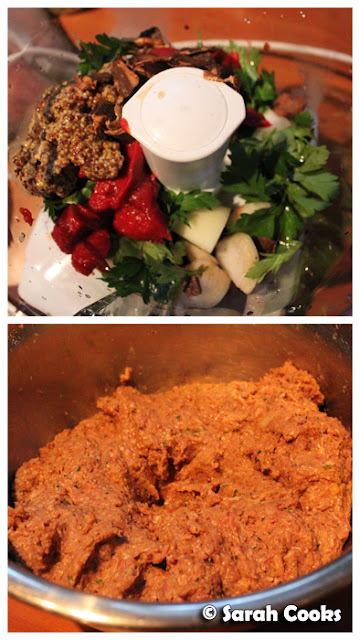 It improves the texture of the mince immensely, making it smoother and more appealingly sausage-like, rather than dry and crumbly. It's an old German housewives' trick! I made the wellingtons the week before the birthday, and stashed them in the freezer. On the night, it was a simple matter of baking them from frozen. Easy! Now, the pastry. Another gift I got - in the week leading up to my birthday - was a copy of the totally fabulous Tartine cookbook (from the San Francisco bakery of the same name), and it was their recipe for flaky tart dough that I used here. It's quite similar to Nigella's shortcrust - that is, it can be made entirely in the processor - except for that you only process the mixture lightly, so that pea-sized pieces of butter are still visible in the dough. This means the dough hasn't been overworked, so it won't become tough. Furthermore, as the pastry bakes, the melting pieces of butter creates pockets of steam, which get trapped in the layers of dough, resulting in a super-flaky pastry! I assembled the mini-wellingtons like sausage rolls, and layered some prosciutto between the meat and pastry. I sliced them into bite-sized pieces, and did the Carême trick of double glazing the pastry. Once glazed, I packed them up and stashed them in the freezer. I kinda underestimated the amount of pastry I'd need, so had quite a bit of mince left over (I've stated the correct amount of pastry in the recipe below.) It was a bit too late for me whip up another batch of pastry, so I formed the filling mixture into little meatballs, and froze them as well. I loved the wellingtons! I was so impressed with the Tartine flaky pastry - it was really easy to make, and the results were great. Not only was the pastry crispy, but also had the most wonderful buttery taste and flaky crumb. The filling had a unique flavour, and they were utterly addictive. I would definitely make these babies again! 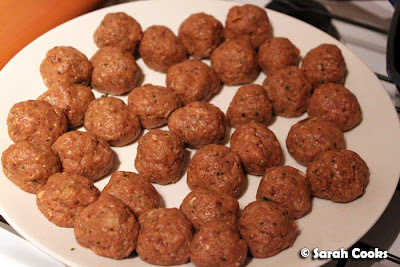 The only problem I had with them is that they gave off quite a bit of liquid in the tray (from the meat filling), so next time I made them I cooked them on a little rack in a baking dish. For the pastry, add the salt to the water and stir to dissolve. Refrigerate until ready to use. Put the flour in the bowl of a food processor fitted with the double-blade. 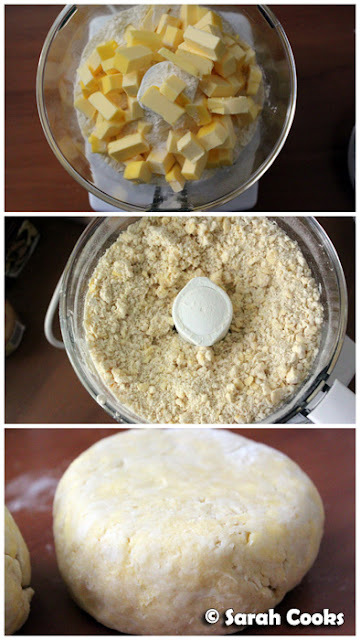 Cut the butter into 1-inch pieces and scatter over the flour. Pulse briefly until the mixture forms large crumbs. You'll still want some of the butter to be visible, in pea-sized pieces. Add the water-and-salt mixture and pulse for several seconds until the dough just begins to come together in a ball. It doesn't need to be smooth, and you should still be able to see butter chunks. Shape the dough into a 2.5cm thick disc and wrap in clingfilm. Refrigerate for at least 2 hours or overnight. For the filling, soak the porcini mushrooms in hot water for 10 minutes, then drain and place in a food processor fitted with the double-blade. Soak the bread roll in cold water for 5 minutes. Squeeze out excess water and add the bread roll to the food processor. Add the beef, onion, garlic cloves, tomato paste, parsley, rosemary, breadcrumbs, Worcestershire sauce, 1 egg and 2 tablespoons mustard. Whizz until combined. Lightly beat the other eggs in small bowl. 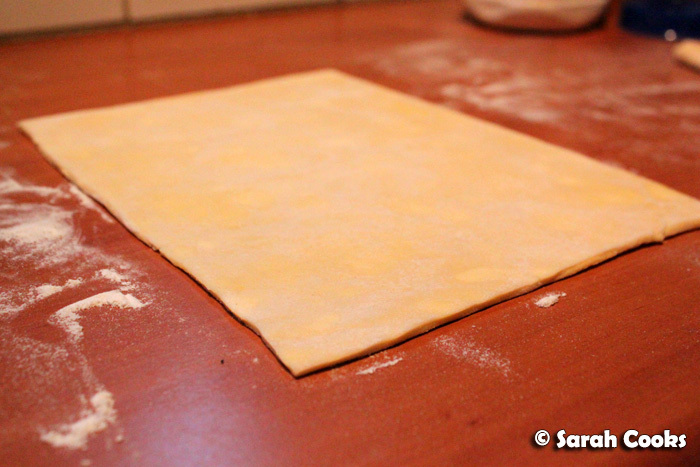 Roll the pastry out into a large square about half a centimetre thick, and cut into rectangles. Layer the proscuitto lengthwise on each rectangle. Divide the beef into portions and form into thick logs. 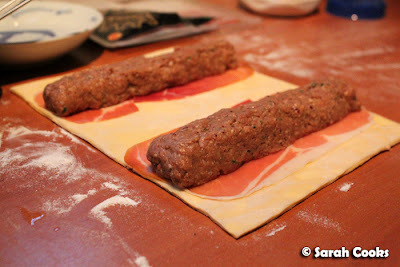 Place onto the pastry rectangles. 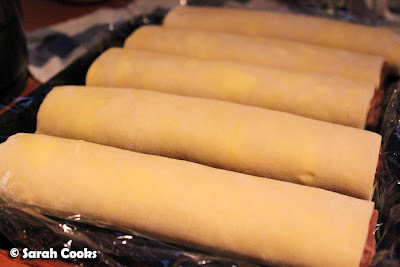 Roll the pastry up, brushing with beaten egg to seal. Place the rolls seam-side down and slice into bite-sized chunks. (If your knife is blunt and the filling is squishing out, place the entire roll in the freezer to firm up for 20 minutes before slicing). Brush the pieces with the beaten egg. Place in the freezer for 20 minutes, then glaze again. From here you can either place the wellingtons into the freezer to cook at a later date, or cook straight away. If so: preheat the oven to 220C. Place a metal cooling rack into a baking dish, and arrange the Wellingtons on top. Bake for 15 minutes or until the filling is cooked through (slice one open to test!) and the pastry is shiny and golden brown. If cooking from frozen you may need to add a couple of minutes to the cooking time. For the sauce, stir together the remaining mustard and sour cream. trust me,these taste as good as they look.my fave dish from the party!thanks again! Mmmm, the recipe looks delicious; I definitely need to try these! Thank you for posting it. I like the sound of both the pastry and the filling... yum! They look amazing - not surprised they were popular! 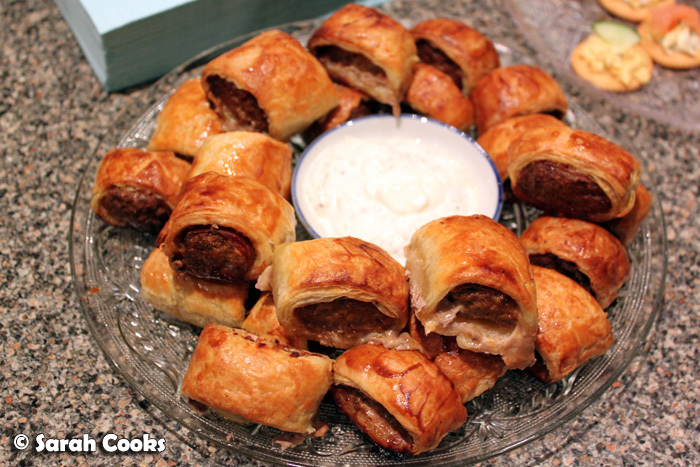 hey, what a great idea instead of the ordinary sausage roll! Hope I get to try this soon.